In addition to the Lower Manhattan Coastal Resiliency project, the City also released the third version of the Climate Resiliency Design Guidelines as a part of the effort to increase the resiliency of City’s infrastructure to the impacts of climate change. The guidelines are available to the public and are recommended for use in municipal capital projects. The guidelines were developed using local climate change projections collected and refined over ten years by the New York City Panel on Climate Change. 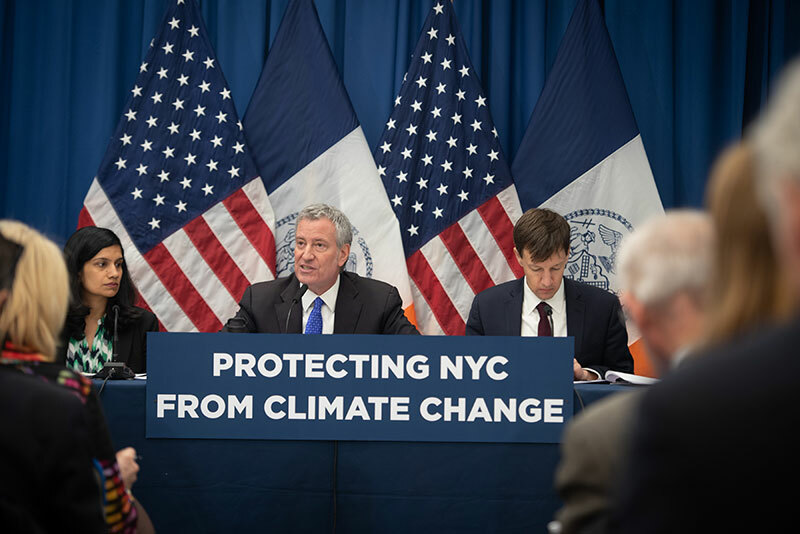 The guidelines will allow for New York City facilities to be designed to withstand the long-term impacts of climate change while avoiding future damages and higher operational costs. “Hurricane Sandy showed us how vulnerable areas like Lower Manhattan are to climate change. That’s why we not only have to reduce emissions to prevent the most cataclysmic potential effects of global warming, we have to prepare for the ones that are already inevitable. Our actions will protect Lower Manhattan into the next century. We need the federal government to stand behind cities like New York to meet this crisis head on,” said Mayor de Blasio. To read the transcript of the press conference, click here. By: May Vutrapongvatana (May is a CityLaw Intern and a New York Law School Student, Class of 2019). Is the resiliency plan for Battery Park City $134 BILLION or $134 MILLION? Thank you for pointing out this misstatement. It is $134 million, not billion. The article has been updated to reflect this information.